Have you ever posted a message on social media or sent a text message you now regret? If you said yes, you’re in good company. 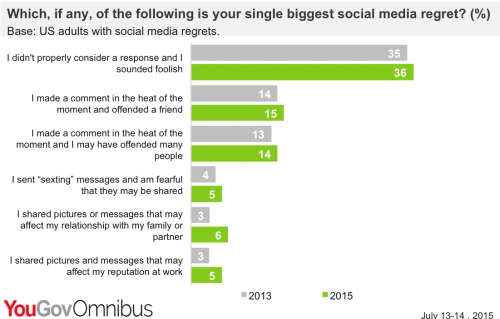 According to survey by YouGov Omnibus, 57% of Americans who use social media are suffering from posting regret. Here’s the scary part, 16% of the group said they routinely regret posting at least once a week! If you cut that group down to just Millennials (ages 18 – 34) the percentage rises to 20%. 10% said that alcohol often led to posting regret and 11% said texting late at night while tired could lead to trouble. Only 5% were worried about getting caught sexting or sharing inappropriate photos. So what’s causing this most concern? Believe it or not, 36% of those with regrets say they simply replied too quickly to a text or posting and their hasty response made them sound foolish. Sounds like quite a few people would benefit from a time delay on all of their devices. Most Americans say that their social media blunders have been personal ones, causing damage to a close relationship. But an increasing number of people are worried about the affect careless Tweeting and texting might have on their career. In July 2013, only 10% of the survey pool said they were worried about damaging their reputation at work. In 2015, that number is up to 21% and I’d bet money that the percentage will rise to 30% in another year. Stories about social media induced firings show up in the news every week, but only 4% of the people surveyed said they’d experienced this kind of trouble. Breaking it down by gender, we see that men are much more concerned (20% vs 8%) about damage to their careers than women. I wonder if that’s because men see themselves as more likely to make a career ending statement in public or if they feel like they have more to lose. The fact that more people are worried about the affect social media and texting can have on their careers is a good thing. We’ve seen too many cases where private messages have gone public and careless Facebook comments have blown up into a public relations nightmare. Social media blunders have taken down workers at every level; from the young, fast food counter worker; to teachers, police officers and seasoned CEOs who are old enough and well trained enough to know better. Don’t lose everything you’ve worked for over one bad Tweet. Do whatever you have to do to keep from posting while under the influence, while angry or while having too good a time. Bottom line: if you’re relying on the words “secure” and “private” to save you, press delete instead of send.